There are many malocclusion problems that can interfere with oral functions and compromise the appearance of the smile. While there are several options for addressing these types of problems, traditional braces remain one of the most popular orthodontic treatments. One misalignment problem that Dr. Ernest Robertson commonly sees in patients is an overbite. An overbite is a condition in which the upper teeth stick out further than the lower teeth. This has an obvious impact on the smile and, depending on how severe the condition is, can lead to oral discomfort. At Dr. Robertson’s dental practice, he can treat an overbite to correct the position of the jaw, improve oral functions, and enhance the beauty of the smile. In most cases, we recommend traditional braces for an overbite, because they provide our New York, NY patients with an affordable and reliable orthodontic treatment option. Braces are one of the most effective orthodontic treatments available. Using a series of brackets and wires, braces allow Dr. Robertson to change the position of the teeth and improve the position of the jaw. 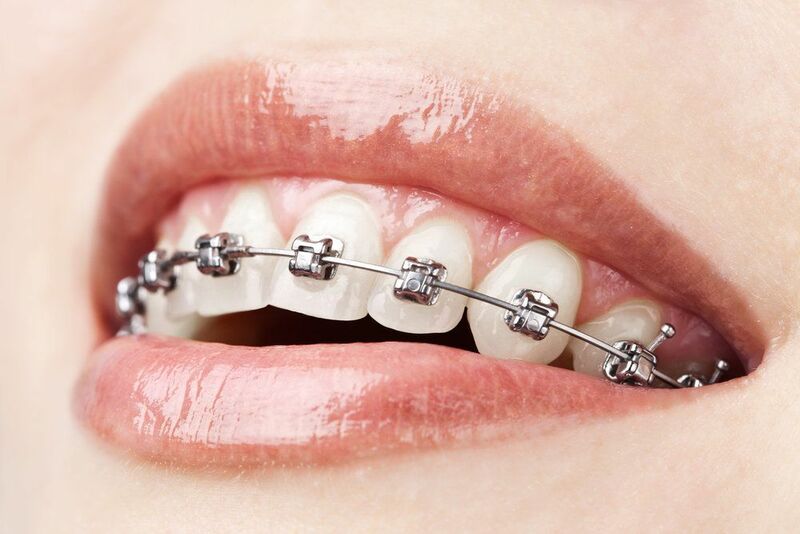 When braces are first applied to the teeth, a metal bracket is bonded to the facial surface of each tooth. Then a thin metal wire is threaded through the brackets. The brackets anchor the teeth and, with the wire, apply subtle pressure that encourages the teeth and jaw to gradually change positions. Throughout braces treatment, the patient will return for monthly adjustments. During the adjustment, the wire is tightened so that the teeth and jaw continue to shift, until the desired results are achieved. Some patients are hesitant to wear traditional braces because the metal brackets stand out against the teeth. However, severe malocclusion problems may not be effectively treated with other orthodontic techniques. Braces are strong enough to provide the force that is needed to address severe malocclusion problems. Braces are particularly effective on an overbite, and can produce straighter teeth that function properly without oral discomfort. Most patients are eager to learn how long they will have to wear braces. Unfortunately, it is not possible to give an exact treatment timeline without examining the teeth. The length of treatment will depend largely on the severity of malocclusion problems. Even after braces treatment begins, the length of treatment may change slightly. It is important to continually readdress the treatment plan as Dr. Robertson sees how the teeth and jaw are responding to the braces. On average, most people can expect to wear their braces for between 12 and 18 months. If the function or beauty of your smile is being compromised by an overbite, it is time to consider orthodontic treatment. Traditional braces are the most affordable orthodontic treatment and provide the most reliable teeth-straightening results. To find out if you are an ideal candidate for traditional braces, schedule an appointment at your earliest convenience.